I've wanted this polish since the first time I saw it (I can't resist the movie reference and the colour combination) and thanks to Sally Magpies I was able to buy it at last! 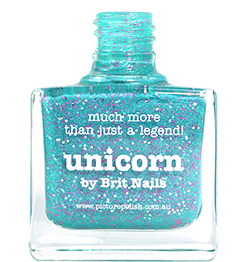 Emily De Molly is an Australian indie brand of nail polish and one of my absolute favourites, everything they make is just stunning. 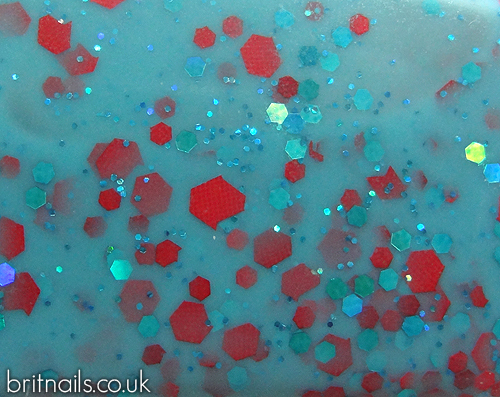 The Fifth Element is an unusual combination of orange and turquoise glitter in a turquoise jelly base. I used 2 coats. Do you own any Emily De Molly? I want all of them!! They're stocked in the UK by Sally Magpies, but unfortunately most are now sold out :( hopefully more will come in! Did you have any problems getting the glitter out of the bottle? I always struggle to get glitter out of the bottle, I have to put the bottle upside down for about an hour before I use it. I still love it though, nothing beats orange and blue together. i love red and turquoise together, what a beautiful polish! I don't have any nail polish of this brand. The colour base is beautiful though the glitter is really stunning!